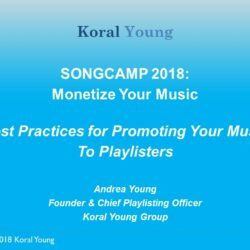 Our co-founder and Chief Playlisting Officer Andrea Young recently gave a talk at the Songcamp2018 online summit on ‘Monetizing Your Music. She talked about the best practices for promoting your music to playlisters. Video and transcript available below.